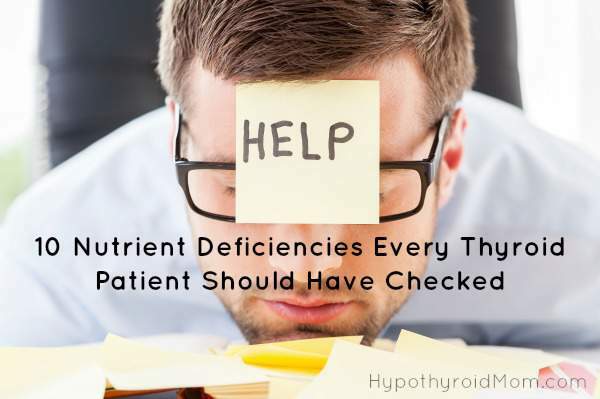 Nutrient deficiency is a part of the thyroid puzzle that has been particularly fascinating to me. 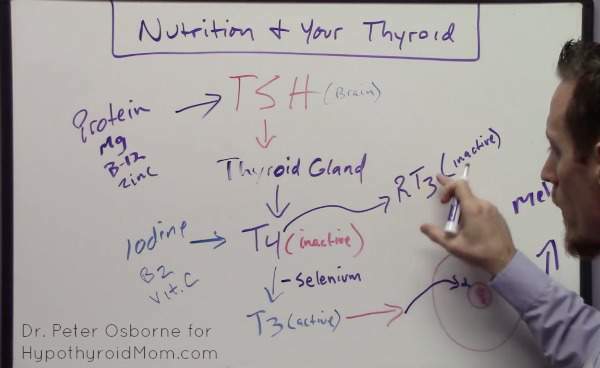 There are certain nutrients essential for thyroid health yet often times doctors are not checking to see if they are a root cause of a person’s thyroid issues. Of the ten nutrients Dr. Osborne mentions in this guest article, I have personally had deficiencies in 7 of them. How about you, could nutrient deficiencies be a part of your thyroid problem? Hypothyroidism is one of the most commonly diagnosed conditions in the United States today but very few doctors actually pay attention to the nutritional relationships between your thyroid and vitamins and minerals. 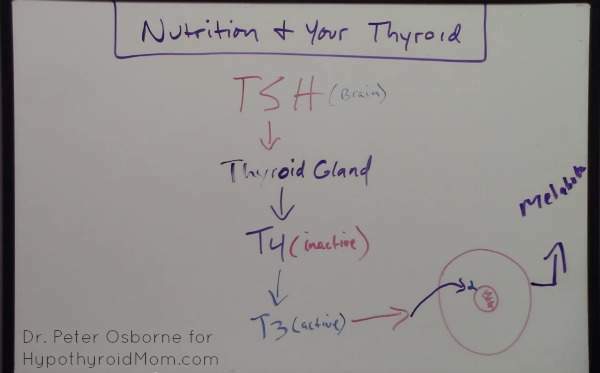 I want to talk today about what you can do to ensure that the reason your thyroid isn’t working properly isn’t just something to do with nutritional deficiency. 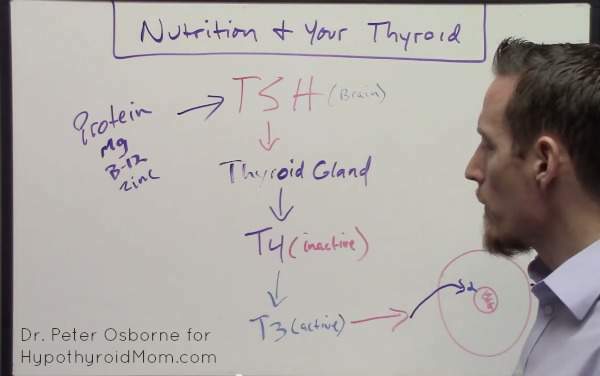 The first thing that we want to understand is that there is a hormone your doctor typically measures TSH (Thyroid Stimulating Hormone) that comes from your brain and it travels to your thyroid gland and tells your thyroid gland to produce T4. That T4 is what we call inactive thyroid hormone. The T4 travels through the blood stream and when it gets to the peripheral tissues it is converted into T3, what we would call the active form of thyroid hormone. T3 then has to get inside of your cells. DNA is in the center of the cell inside the nucleus. On the surface of the cell nucleus we have this little tiny key hole called the nuclear receptor and, in the case of thyroid hormone, that little nuclear receptor is where thyroid hormone binds. We get the binding of T3 onto that nuclear receptor and that my friends is what increases your metabolism. What are the symptoms of low thyroid? With low thyroid most people will experience energy loss, weight gain, hair loss, dry skin, elevated cholesterol, constipation. These are all common symptoms of low levels of T3 or low levels of thyroid hormone overall. Now I hope you have a general understanding of the way these hormones work. Now let’s insert the nutritional parameters so that you have a better understanding nutritionally of what needs to happen. The very first thing is that this TSH doesn’t just magically appear. In order to properly make TSH you have to maintain adequate protein in your diet. Magnesium, vitamin B-12, and zinc are also required to make this particular hormone. These three micronutrients (magnesium, B-12, zinc) and this major macronutrient (protein) are all responsible for helping us to properly produce TSH. There are certain nutrients required to make T4. One of them is iodine. That 4 in T4 refers to 4 molecules of iodine, so to make T4 you have to have 4 molecules of iodine. If you ever see iodized salt, salt in the United States is iodized as a result of widespread goiter epidemic. Goiter is when the thyroid enlarges because of in this case iodine deficiency. This is why table salt is iodized however I don’t recommend trying to get your iodine from that particular source because there are other negative consequences to over-consumption of standard table salt. You can get iodine from eating fresh vegetables, seafood, kelp, and seaweed. Iodine is not the only nutrient required to make T4. There’s a mechanism inside your thyroid gland that helps to draw iodine into the thyroid gland. That mechanism is a little kind of doorway called a symporter and it requires Vitamin B2 and Vitamin C. That symporter won’t work to bring iodine into the thyroid gland unless you have these two nutrients in place to run that symporter pump. 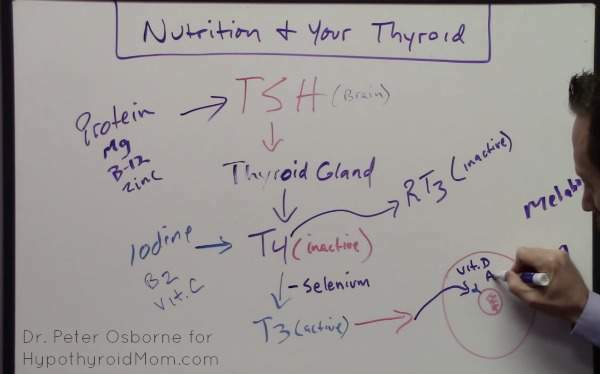 So far we have talked about 7 different nutrients associated with getting from TSH down to T4. Now we have to get from T4 to T3. This process right here also requires nutrition. There is an enzyme that does this conversion for us and that enzyme is driven by the nutrient or mineral selenium. Without selenium we won’t convert T4 to T3. What we’ll actually do without selenium is make another compound called Reverse T3 (RT3). Reverse T3 is also inactive. The problem is if your doctor doesn’t run a Reverse T3 lab test. Many doctors don’t run Reverse T3. Most doctors from my experience look at TSH only and they skip all these other components. If your doctor isn’t looking at Reverse T3, and maybe they did measure T3, you can’t differentiate Reverse T3 and T3 from each other without actually teasing them out. The way you do that is have your doctor measure Reverse T3 as well as T3. Now when we come over from T3 and it has to activate the nuclear receptor on the surface of the nucleus of the cell. That requires Vitamin D and Vitamin A. So Vitamin D deficiency and Vitamin A deficiency can also stop T3 from activating your cell to increase your metabolic rate and increase your energy. If you have a diagnosis of hypothyroidism, your doctor says, “Hey, you’ve got hypothyroidism. We’re going to put you on Synthroid or one of these thyroid medications.” You need to have a conversation with your doctor about this component because if your doctor is not measuring these ten nutrients what’s going to end up happening is they are going to medicate you and the medication may help initially but over time as you maintain micronutrient deficiencies your thyroid is not truly going to improve. You’re not going to be treating the origin of why the thyroid is low in the first place. You’re just going to be masking it by putting artificial hormones in. Some people will say but I’m taking bioidentical thyroid hormone like Armour and that’s okay too. Armour is more like your natural thyroid hormone than something like Synthroid, however I don’t recommend using any kind of thyroid medication, bioidentical or not, UNTIL you’ve had a conversation with your doctor to evaluate these nutritional parameters. It’s very common that I see patients once they come to see me they are already on a medication and once we start correcting these deficiencies, what ends up happening is their medication becomes too strong and they actually become hyperthyroid (symptoms like excessive sweating, anxiety, night sweats, inability to sleep, hot flashes). So when you start getting your nutrition corrected if you are on a thyroid hormone medication remember you may develop these symptoms of too much thyroid and may need adjustment in your dosage. 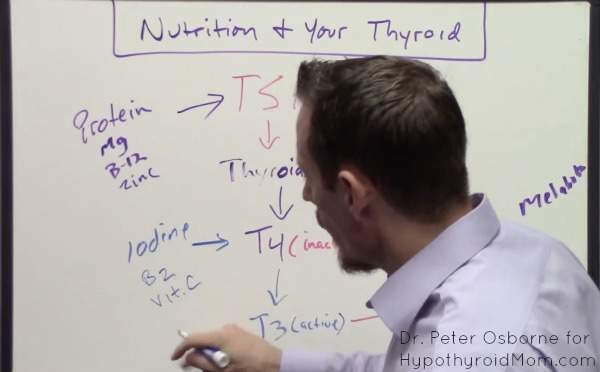 The bottom line is if you’ve been diagnosed with hypothyroidism have your doctor check these nutrient levels so that you can ascertain the nutritional potentials for why your thyroid is low in the first place. Dr. Peter Osborne is the clinical director of Town Center Wellness in Sugar Land, Texas. He is a doctor of chiropractic and a Board Certified Clinical Nutritionist. His clinical focus is the holistic natural treatment of chronic degenerative musculoskeletal diseases. He is an expert in the relationship that gluten sensitivity and food allergies play in chronic inflammation. He has helped thousands of patients recover from chronic painful conditions. Dr. Osborne is the author of the book No Grain, No Pain: A 30-Day Diet for Eliminating the Root Cause of Chronic Pain . GREAT article !! very good information. I take Synthroid right now 0.088 mg. I go to my Dr. Dec 10th 2018 and have written down all that I need to talk to him about *Micronutrient deficiencies* ! I have started on “The Shepard’s Code” May 30th 2018 and have lost 31 pounds and inches so far. With this weight loss I feel as though my thyroid is off and I may have become deficient as well. Thank you so much for such great information. All the best with your doctor appointment, Sheree. Here in this article you’ll find a list of important thyroid lab tests to ask to have run. So important to take non synthetic, whole food vitamins. I buy the superfoods- both whole & powders: Amla, Moringa,Ashwagandha, Reshi Mushroom,Acerola Cherry,hulled-hemp-seeds, ect and NON FORTIFIED Nutritional Yeast. When I’m feeling unable to choke all of that down, I take an(iron free)Naturelo-brand, women’s multi vitamin. My dr of 7 years had me on many medications, Synthroid being one. When he was busted/shut down. I couldn’t get any of my meds and the next dr said I had no thyroid issues! I had all of the symptoms & suffered greatly because of the meds then no meds. I WAS overweight. Now? I am 84lbs and suffering with symptoms of hyperthyroidism. I eat,eat,eat & cannot gain weight. I’ve learned that 90 to 95% of americans are deficient in Iodine. I am 54 y/o and a dr has NEVER tested for any nutritional deficiencies. They want to do dangerous, invasive testing and give me tons of drugs(I just say, NO! now! )but won’t test for the most probable culprit? It’s a shame that we don’t have the medical freedom, to seek traditional forms of healthcare. Allopathy according to Dr Gary Null & many others seems to be one of the biggest killers in our country. They can keep their synthetic drugs,synthetic supplements, invasive procedures and the filthy death traps, they call hospitals. I became healthier, the minute, I realized our health care system is a death trap. Learning more about Iodine and how to test yourself for vit/mineral deficiencies. I don’t want to be ‘treated’. I want to be cured. do we take all these vitamins daily? or do we take just a muti with those in it? I am on armor thyroid 15mg. Tried synthroid too. I would like to get off of meds. You forgot a very important one; ferritin! Hi Janice, I believe iron (ferritin) is included in the “Protein” designation. Meats, especially red meats, are a great source of ferritin, a type of stored iron that helps the body produce hair cell protein. Do you have a scientific reference for the requirement of B12 for teh creation of TSH?